The Senate has again rejected the confirmation of the Acting Chairman of the Economic and Financial Crimes Commission (EFCC) Ibrahim Magu. Mr Magu was rejected after the Senators voted against his confirmation. The Senator representing Kogi west Dino Melaye, had cited a fresh security report from the Department of State Services (DSS) disqualifying him based on his failure of an integrity test. Mr Melaye said two reports from the DSS were released on Tuesday on Ibrahim Magu and they both indicted him. The DSS report basically contained the same allegations raised by the service in December which bothered on the purchase of Mr Magu’s official residence, his and past record as head of the EFCC’s economic governance unit, as well as his relationship with Mohammed Umar. of 40 million Naira for Magu’s rented apartment. 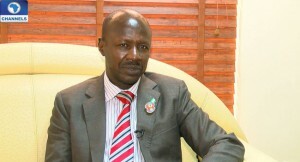 This is the second time in three months that Mr Magu is being rejected by the lawmakers. The first was in December 2016, after which he was re-nominated by President Muhammadu Buhari in January, 2017, after consulting with the leadership of the Senate. Mr Magu has been in acting capacity as EFCC chairman since November, 2015. Explaining the reason behind the decision, the Senate had in 2016 said that security report available to it showed that Mr Magu was not fit to be chairman of the body. In that regard, the lawmakers sent back his nomination letter to President Muhammadu Buhari. Addressing journalists at the National Assembly, Senate Spokesman, Aliyu Abdullahi said that based on security reports, the Senate cannot proceed to confirm the acting EFCC Chairman. “Based on security reports available to the Senate, the Senate cannot proceed to confirm Mr Magu, consequently, the Senate rejects the nomination and returns the nomination to President Buhari,” he said. Shortly after the Senate spokesman briefed journalists, the acting EFCC Chairman was seen hurriedly leaving the National Assembly complex. With the Senate throwing back the nomination of the Mr Magu back to President Buhari, it is not clear at this point what the President’s action would be.